In addition to the standard functionality, the Details screen for a Single Calendar Event lets you configure the dates of when the event is occurring. All Day Event: If set to Yes, no times will be used in the start and end dates. Use End Date: If Yes, no end date will be used. Start Date: The start date and time of the event. End Date: The end date and time of the event. 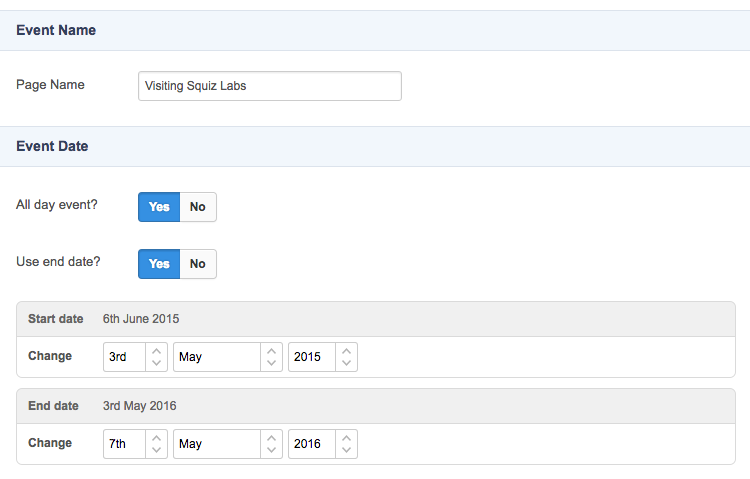 Recurring calendar events have additional fields for configuring the date of the event. This section allows you to select how often the event occurs. Daily: This option will run the event on a daily basis. When selected, additional fields are displayed including Every Day, Every x days (e.g. Every 10 days), Every weekday and Every weekend day. The Every weekday option will only be enabled if the start date of the event is during the working week. Similarly, the Every weekend day option will only be enabled if the start date is during the weekend. Weekly: This option will run the event on a weekly basis. When selected, additional fields are displayed including Every week on day and Every x weeks on day (e.g. Every 3 weeks on Friday), where day is determined by the start date of the event. Monthly: This option will run the event on a monthly basis. When selected, additional fields are displayed including Every Month and Every x months (e.g. Every 3 months). 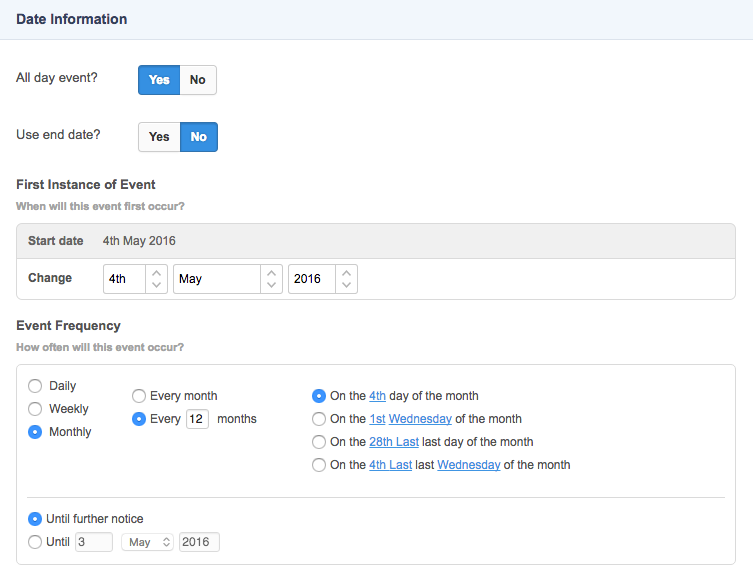 Additional options allow you to select when to run the event during the month. These options include On the x day of the month, On the x day of the month, On the x last day of the month and On the x last day of the month, where x and day are determined by the start date of the event. Until further notice: This options allows you to continue running the event without specifying a finishing date. Until: This option allows you to specify a finishing date for the event to continue running until.